NYC, 02/25/2019, 6:00PM. 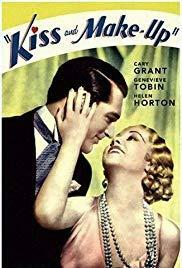 Kiss and Make Up (1934): a romantic comedy with Cary Grant. Dr. Maurice Lamar is a noted plastic-surgeon who makes his rich clients beautiful. He makes Eve Caron, the wife of Marcel Caron, so satisfied with his skilled hands that she leaves Marcel and marries Maurice. Hijinx ensue. 78 min. Director: Harlan Thompson. From 1932 to 1966, Cary Grant starred in over seventy films. In 1999, the American Film Institute named him the second greatest male star of Golden Age Hollywood cinema (after Humphrey Bogart). He was nominated for the Academy Award for Best Actor in Penny Serenade (1941) and None but the Lonely Heart (1944). Widely recognized for comedic and dramatic roles, among his best-known films are Bringing Up Baby (1938), Only Angels Have Wings (1939), His Girl Friday (1940), The Philadelphia Story (1940) and Charade (1963).